boycott any future Arab summits unless Egypt regains its Arab League Summit seat. preside over, beginning July 1.
really wants peace, Baum said. a shorter or a "third night"
in fact has been done." portfolio, at closing ceremonies at the Western Wall. course of the two-and-a-half-day conference. New York. "I think it speaks for what we came here for. States and live with, and agree with, and talk about." does not give it a carte blanche. Temple Beth Am on March 18. 8, services will begin at 10:30. U.S. swap debts for drugs, i.e. 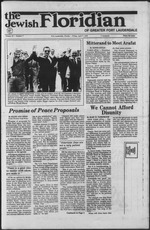 proposed an increase in U.S.
rights, Jewish life and Israel. Blintzes, a treat your whole family will enjoy. Golden,. For the traditional taste of Jewish life. fab as a "normal discussion"
happy with what they heard. will have to talk to the PLO. ans in the Jewish community." easier if we had help." Hanker JTA. 8ma Aria. WN8, NBA. AJPA. aei FPA. Jwi. Floridtaa Dm* Nm GaenatM Kaekratk W Mrrhuti* Afrerttoii. help remove cholesterol from your system. you don't exactly have to suffer doing it. cooking spray all carry the symbol. cials in Iraq and Saudi Arabia. sense of isolation these days. tions to negotiate with Israel. motion by the opening of U.S.
will end up, and without U.S.
the Sinai and he was right. oil glut and depressed prices. be neither quick nor fixed. gic role in protecting U.S.
flank still needs the backstop. 15 at Beth Israel in Sunrise. ball and racing R.C. cars. with or without your children. Temple Beth Israel in Sunrise. Keeping Kosher with Breakston- no better w it family. ment of the peace process. to elect their own leaders. are "out of the question." Egypt and other Arab nations. tainly doesn't talk for them. to accept it, well and good." ...the sweet end to even Seder. The Guide to the PerpUmd"
|ome of his religious beliefs. ig fits Maimonides very well. and I don't see it in the future. the job market will adapt. ter of a human hair. no one will ever take out again. so there will be a bigger pie." ed by a lobby expansion. spoke of some new "ideas." Shamir's visit will be a failure. for the last quarter of 1988.
has somothlng so tiny mada It ao big. are packed with tiny little tea leaves. Because tiny is tastier! Because they're Kosher for Passover. marking to let you know. Edgar Bronfman said the U.S.
tinue on their current path,"
pollutants, no urban wastes, no additives. als, including calcium and magnesium. ary of State James Baker. thinking on the issue of ''Who is a Jew." on either side of the dialogue,"
"Feel the personal touch of professionals with 30 years of experience." tenderness of naturally grown Empire Kosher poultry. difference in every tender bite! service open to today's rabbis. iora had met with Shamir. force was almost solidly Arab.